Jeth and I have mostly continued our goal of spending $20 a week on groceries. We uh…lost our way a little around Christmas (extra snacks and such), but are getting back on track now that we’ve returned to our usual school and work routine. Since some of you have asked, I wanted to share our most recent month of budget eating. 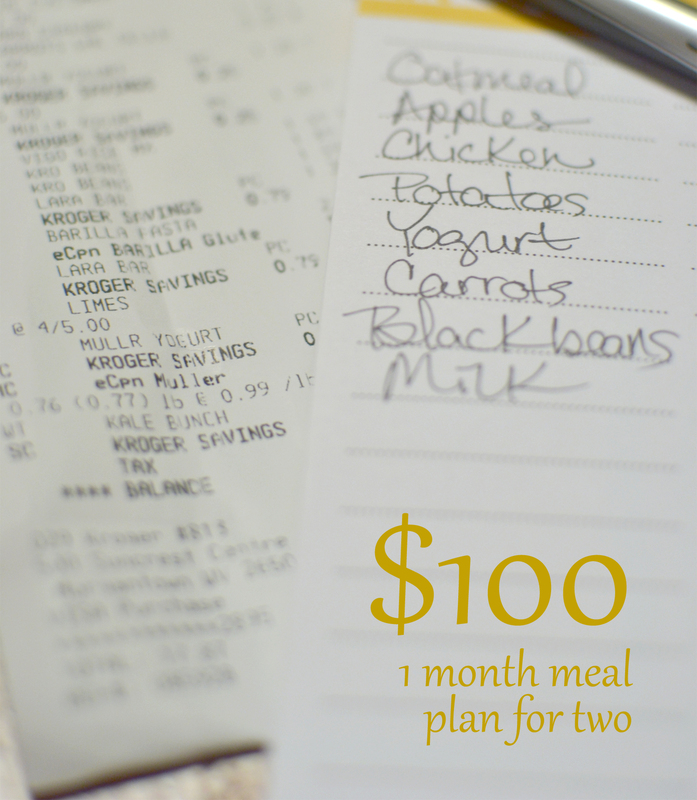 We upped the budget to $100 a month, or ~$25 a week, with a few “scraping the pantry” days at the end. The extra five dollars makes a big difference – we can splurge by buying things like prosciutto or ingredients for fresh salsa. Nothing fancy, but things that are harder to fit into a $20 budget. We’ve saved the most money lately by putting a little more time toward food prep – soaking and cooking dry beans, portioning and freezing bulk packages of meat, cooking down chicken carcasses for stock and meat bits, buying more milk than we need and freezing the extra in mason jars, and making homemade yogurt. All pretty easy stuff, if you’ve got the time. We just got a cheese-making kit for Christmas, so expect homemade cheese to be featured soon :). We’re also part of a student organization that feeds us at our weekly Friday meetings! If we didn’t have these perks, I would stretch our dinners a little further by using more rice, potatoes, or other inexpensive ingredients. More dinner leftovers = more lunch the next day. Another money-saving option is to plan “potluck” meals with friends – if each person brings one ingredient for something like tacos or homemade pizza, the cost of a dinner can be pretty cheap. Instead of taking up more space here with shopping lists and meal ideas, I put them into a spreadsheet (download the meal plan, or view it in Google Docs). It was easier to keep track of prices that way (and Excel did the math for me). We are both fortunate work in restaurants where we get free lunch a couple days each week. One page is 4 week mega-grocery list, and the other is full of meal ideas that we enjoyed last month. Some of the recipes are already on here, and I’m posting the others as I have time. Happy planning! Update: I decided to link all of the recipes directly to this post so that they’re easier to find. Some of them are ones I’ve come up with and are posted on this blog, and others are ones I’ve found elsewhere on the web. There are a couple really simple ones like fried rice, applesauce muffins that I didn’t link because they’re so easy to just run a Google search for (and the recipes I used for those weren’t really “special”- a web search will give you dozens of workable recipes). Enjoy! Kielbasa and white bean soup (I nix the leeks and add a can of diced tomatoes – I’ll post my own recipe here soon…promise). Sausage, rice, and beans: a bag of Vigos yellow rice, 1 lb hot or mild sausage, and a can (or ~1/2 bag cooked dry) black beans. Black bean and sweet potato burritos. The recipe I use is no longer online, so I’ll have to post my own version. It’s similar to this, but without the extra veggies. This is awesome! Thank you so much. Just curious if you may be able to share other months as well? Or do you usually have the same stuff each month? We have kind of a seasonal rotation, so during the fall/winter we fall back on the same staple meals. Maybe I’ll post a couple more meal plans in the spring, though! Hi wad just wondering where I can find the recipes for the meals? Looking forward to trying this thanks! Kelsey, I just added links for most of the recipes to this post! Does this include Alcoholic beverages since they are sold in the grocery store as well?? I’m curious where do you shop? Things like kale and heavy cream are so much more expensive at our grocery store. We also get a big tub of peanut butter that lasts a longer time, but costs more up front. It’s hard to budget around things like that. What recipe do you use for the stuffed peppers?